Cancer Res 2014 74(1), 298-308. A-769662 purchased from Selleck. Concentration-dependent effect of synthetic AMPK stimulator, A-769662, applied for 10 min on phosphorylated α subunit of AMPK. 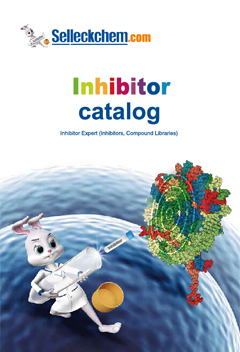 AMPK inhibitor (compound C, CC) was added to some samples at 10 uM. **p < 0.01, ***p < 0.001 vs. sample without A-769662 by ANOVA and Tukey post hoc test. Pharmacol Res 2014 81, 34-43. A-769662 purchased from Selleck. Eight- to 10-week-old Ldlr-/- mice fed a standard laboratory chow were fasted overnight, fed at 07:00 h for 2 h, and refasted at 09:00 h. Intraperitoneal injection of vehicle, GW1516 (3 mg/kg), or A-769662 (30 mg/kg) (n = 6/group) occurred at the beginning of the refasting period at 09:00 h. Immunoblots of AMPK and ACC in freeze-clamped liver lysates 90 min postinjection. Representative immunoblots with quantitations are shown. Asterisk (*) indicates significant difference between vehicle and treatment; Student's paired t-test (P < 0.05). J Lipid Res 2014 55(7), 1254-1266. A-769662 purchased from Selleck. Cultured PANC-1 pancreatic cancer cells were treated with vehicle (DMSO, 1%), 10 uM of belinostat (BS, for 2 h, 4 h and 6 h) or A-769662 (10 uM, 2 h), phospho- and total AMPK and ACC were detected by western blot, tubulin (loading control) was also tested. 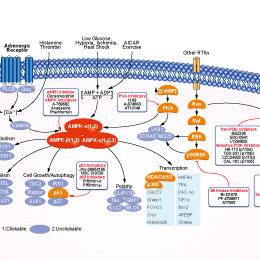 AMPK and ACC phosphorylation was quantified as described. Biochem Biophys Res Commun 2013 437(1), 1-6. A-769662 purchased from Selleck. AMPK activity is measured by monitoring phosphorylation of the SAMS peptide substrate (20 mM in standard assays and 100 mM in additivity assays) following a previously described protocol (Anderson et al., 2004). To determine whether A-769662-induced AMPK activation occurs in a reversible manner, AMP or A-769662 are preincubated with rat liver AMPK for 10 minutes at 20 times standard assay concentrations prior to dilution and measurement of AMPK activity. Cell viability of MEF cells treated or not with A-769662 is performed as follows: cells are harvested by trypsinization and incubated with 0.5 mg/mL RNase and 50 μg/mL propidium iodine at room temperature in the dark; cell viability is analyzed by flow cytometry using a FACScanto flow cytometer, using an excitation laser at 488 nm and a propidium iodine fluorescence detection at 600 nm. To determine the proportion of cells in each phase of the cell cycle, cells are harvested by trypsinization, collected by centrifugation, washed in PBS and fixed overnight in 80% ethanol at -20 °C. Subsequently, these fixed cells are centrifuged to remove the fixative and incubated for 20 minutes in the dark at room temperature in PBS containing 0.5 mg/mL RNase and 50 μg/mL propidium iodine. Flow cytometry analysis is performed as above. The proportion of cells in G1, S, and G2 is determined using the MODFIT program. Cell culture pictures are taken at the indicated times using a camera coupled to an inverted microscope with a 20 × objective. Formulation: A-769662 is dissolved in DMSO. Cool B, et al, Cell Metab, 2006, 3(6), 403-416. Sanders MJ, J Biol Chem, 2007, 282(45), 32539-32548. Moreno D, et al, FEBS Lett, 2008, 583(17), 2650-2654. Pevton KJ, et al, J Pharmacol Exp Ther, 2012, Jun 13.